Often sickly as a child, Catholic columnist and author, Marge Fenelon, spent many days lying on the living room sofa looking up at the picture of Mary and baby Jesus on the wall. The print, a copy of Mother Thrice Admirable, was a gift to her mother from Fr. Joseph Kentenich, the founder of the Apostolic Movement of Schoenstatt, when Fenelon was just a year old. 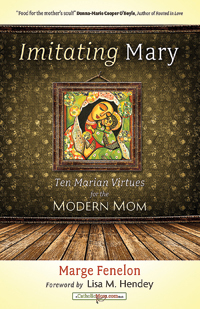 That yearning to write her own book about Mary spurred her recently published, Imitating Mary: Ten Marian Virtues for the Modern Mom. In the book, Fenelon, a Milwaukee native, candidly shares her experiences as a mother to encourage others to understand that the motherly vocation can be an extraordinary witness for the Kingdom of God. “At first I couldn’t put my finger on what kind of book to write, or how I would put it together,” she explained. “Within the last two years, and while mulling it over with my Spiritual Director, (the late) Fr. Jonathon Niehaus, I.S.P., I finally was able to nail down the concept and scope of it. In her book, Fenelon chose 10 virtues: patience, trust, obedience, endurance, courage, strength, hope, faith, and joy. She combines each virtue with personal anecdotes along with Mary’s historical background to bring an understanding of her as well as a new appreciation for motherhood. “While it was my idea — with Father Jonathon’s help — to make this a book that would bring Mary to life, it was the publisher’s idea that this book is best addressed to mothers of all ages, and I agree,” she said. The Milwaukee native and member of St. Anthony of Padua Parish has been married to her husband, Mark, for 30 years. They have four children, ages 27, 25, 22, and 17. In preparing and researching this book, Fenelon was unable to draw upon her own relationship with her mother, as she was unable to offer her as positive mothering experience. Fenelon has held a membership in the Apostolic Movement of Schoenstatt (a Catholic lay movement of renewal in Christ through Mary) for many years. Despite her lack of maternal support, Fenelon recognizes that the Blessed Mother has been with her throughout all stages of her life and transformed her with each advancing year. “When I was a child and through my teens, I had more of a ‘gimme, gimme’ attitude toward her, always asking her for this or that thing I thought I needed or deserved,” she explained. Looking back, Fenelon admits that writing a book about Mary was a daunting task for her at times. There were days she would become fretful, but realized that the only way she could accomplish this monumental task was to proceed prayerfully and by placing her trust in Mary. This entry was posted in Imitating Mary, Madison Catholic Herald, Marge Fenelon, Marian virtues, Mother's Day. Bookmark the permalink.